External Affairs Ministry Spokesperson Raveesh Kumar was asked whether the controversy relating to Rafale deal impacted the ties between the two countries. India on Thursday said the controversy surrounding the procurement of 36 Rafale jets from France has not impacted the strong ties between the two strategic partners at all. "We continue to enjoy very strong relationship with France. It is our strategic partner. I can say that this (Rafale controversy) has not impacted our relationship at all," External Affairs Ministry Spokesperson Raveesh Kumar said. He was asked whether the controversy relating to Rafale deal impacted the ties between the two countries. 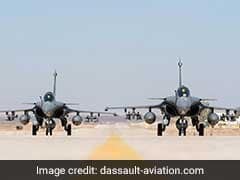 There has been a fierce political battle between the ruling BJP and the Congress over the procurement of the jets from French aerospace major Dassault Aviation under a Rs 58,000 crore deal. The Congress has been alleging massive irregularities in the deal, saying the government was procuring each aircraft at a cost of over Rs 1,670 crore as against Rs 526 crore finalised by the UPA government when it was negotiating a deal for procurement of 126 Rafale aircraft. In a report last week, French publication Mediapart said Dassault Aviation, the manufacturer of Rafale, had to choose Ambani's firm Reliance Defence as its offsets partner in India as a trade-off for getting the deal. In a statement, Dassault Aviation said it has "freely chosen to make a partnership with Reliance Group", as it rejected the report by French publication Mediapart. The latest report followed former French President Francois Hollande's comments last month that France was given "no choice" on selection of the Indian partner for Dassault and the Indian government proposed the name of the Indian company. Mr Hollande was French president when the Rafale deal was sealed.